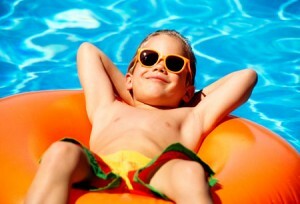 Sun Safety Week begins June 1. LAFAYETTE, Ind. — As Sun Safety Week kicks off this Tuesday (June 1) and summer brings more people outside, it’s important to review the consequences of extended exposure to the sun’s ultraviolet rays. The American Cancer Society has found that more than one million cases of skin cancer are reported each year and the Journal of American Medical Association reports that one in five will develop skin cancer in his or her lifetime. “While skin cancer is on the rise, it can be prevented by limiting and avoiding exposure to the sun’s radiation and by monitoring changes in one’s own skin,” said Dr. Bob Martin, a dermatologist at Clarian Arnett Health. Skin cancer can be prevented and treated if caught early in its development, so knowing what to check and when you should consult a physician is important. Basal cell cancer – The most common type of skin cancer originates from the germinative cells in the epidermis, the basal cells. This cancer grows very slowly and is least likely of all skin cancers to spread. If detected and treated early, it has a greater than 95 percent cure rate. This cancer usually appears as red or pearly, waxy bumps that sometimes ulcerate. Squamous cell cancer – Originating from the more mature cells of the epidermis, squamous cell cancer is the second most common type of skin cancer. This type spreads faster than basal cell cancer, yet if treated early has a high cure rate. It appears as a firm, red nodule or a flat lesion with a scaly, crusty surface. Melanoma skin cancer – The least common, but most life-threatening skin cancer, originates from the pigment producing cells, the melanocyte, which are also found in the epidermis. Melanoma metastasizes more quickly than the other types of skin cancer. Melanoma’s appearance ranges so it is important to monitor any change on the skin. This type of cancer can appear on normal skin or develop from moles or skin lesions. This summer, utilize tactics to help prevent skin cancer. Avoid the sun from 10a-4p when UV rays are at their strongest. Wear a sunscreen with SPF15 or higher. Apply 20-30 minutes before sun exposure and reapply every two hours. Wear protective clothing including a wide-brimmed hat, dark, tightly-knit clothing and sunglasses. The key to early detection is regular skin checks. Follow the American Academy of Dermatologist’s ABCDEs of skin cancer detection.